I love seeing the different seasons that come and go each year, but no season excites me like football season. There is just something about watching this sport that can keep me captivated for an entire weekend. If you are lucky enough to live in certain communities, Friday night lights kick off our festivities. Saturday is an all day event. College football can be watched from morning until evening with seemingly countless games on every channel. And of course Sunday brings us the NFL. And two bonus games have been added to the NFL schedule throughout the years. We now have both Monday night and Thursday night football. Nearly every day provides us with a reason to watch the game. To the rabid fan, this can be considered nirvana. But, to the wives of those whose lives become consumed by football, it is 6 months of not having their husbands around. I don’t remember the 1st time I heard the phrase, but it certainly is applicable. 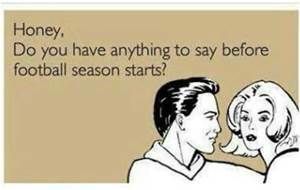 During football season, many wives become football widows. Their husbands tune out parenting responsibilities, the quit working on jobs around the house, yards don’t get mowed, projects are forgotten, and wives are neglected. Yes, I know that some of you men have wives or girl friends that are football fans. But, not every woman is into football the way many men are. As such, men, we need to be mindful of what we are leaving behind when the games come on. As I said, I love football. I will watch football even though my beloved Bears lose. I will watch football even though my college team can’t fight their way out of a wet paper bag. But, I cannot love football so much that I love it more than I love being a father, a husband, and a child of God. So, what can you do to assure that your wife knows that you haven’t abandoned her? Don’t make your week all about football. Yes, there are games on seemingly every day. However, that does not mean that you need to watch every game that is on TV. Just because you play fantasy football doesn’t meant that you have to catch every pass, every sack, and every touchdown. It takes 15 minutes to jump on line and check the stat lines for your team. One of the easiest ways to not make your week about football is to schedule certain games with your wife that you desire to watch. My wife knows that if the Bears are on, I am watching the game. The other games are games I would like to watch. However, my wife knows that those are games that I am not emotionally invested in as I am not a fan of the Packers, Lions, Vikings, etc. As such, she knows that if she needs my attention, a project done, or someone to talk to that she can ask for it during those times. But, more importantly, I don’t bother turning those games on if there are things that need done. If she needs a few hours to herself, I can be a dad and play with my kids. Don’t make football your life. I know that we can be a bit fanatical about sports. But men, when your wife needs your attention, turn the sound off or better yet, turn the TV off and let her know she has your attention, even when your favorite team is about to score. She needs to know that she is the love of your life and not your favorite sports team or favorite player. One of the biggest reasons marriages fall apart is because husband and wife are not talking to each other. Don’t be that couple. Give your wife the attention she deserves. Let me put it like this, when you make petitions to your God, how would you feel if he isn’t really listening because he is distracted with things he deems more important than you? Would you not feel frustrated if you felt God replies to your prayers with a “Yea, Yea, Yea, I’ll get to that in a moment.” If we wouldn’t want God to half-heartedly listen to our requests and petitions, why would we ever listen to our wives with the same disdain for her feelings? Get out and play the game. If you really want to make football a bigger part of your life, pick up a pigskin and throw it around with the kids. Your children are not going to want your attention all the days of your life. There will come a time when they won’t want to hang out with you. There will come a time when you will cease to be their hero. Use the time you have wisely. Teach them to love football by helping them to correlate football to time dad spent with them, not time dad spent glued to the TV all weekend ignoring them.